In animation, a layer is an individual column, level, or character. The scene’s layers are superposed to form the final image. When you import an image or draw in a panel, you are actually adding artwork to one of its layers. 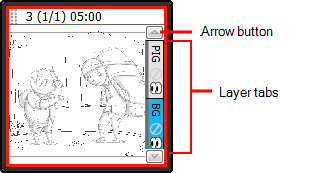 By default, each panel has two layers, a background (BG) and a foreground layer (A). As you add layers, they are automatically assigned subsequent letters in alphabetical order, but you can rename them. They are also placed on top of the selected layer or at the very top of other layers if there is no layer selected in the panel. 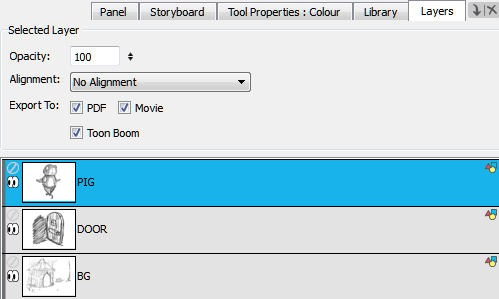 When you open a project, the Stage view is displayed by default in the Storyboard Pro window. 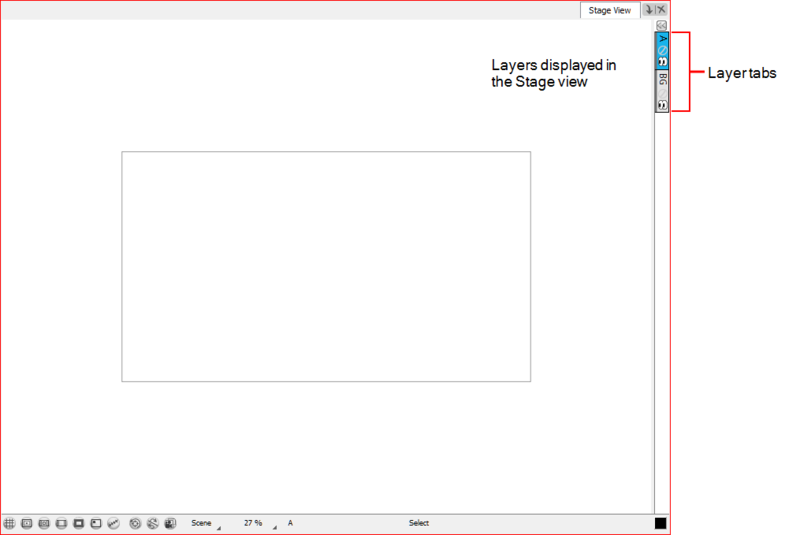 In the Stage view, tabs are always displayed, allowing you to navigate between layers. If the Thumbnails view is large enough, layer tabs are displayed for each pane there as well. By default, an empty layer will have the closed eyes icon to indicate that it is empty. As soon as you draw or paste anything on an empty layer, the eyes icon will open. Select a layer by clicking it. The active layer is highlighted in blue. Choose a drawing tool and begin drawing in the Stage view. ‣ From the View menu, select Layers. ‣ From the top menu, select Windows > Layers. 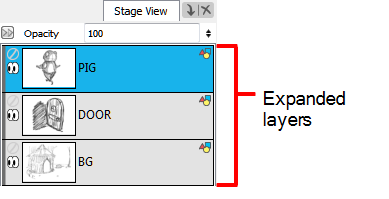 ‣ Stage view: Click the layer tab of the layer you want to select. ‣ Layers panel: Click the layer you want to select. ‣ Thumbnails view: Click the layer tabs of the layer you want to select. 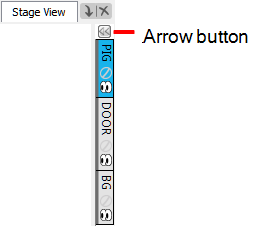 Arrows above and below the layer tabs indicate additional layers. ‣ To select multiple layers, press [Ctrl] (Windows) or [⌘] (Mac OS X) and click each layer you want to select. Also, press Shift and click one layer and then another to select a sequence of layers. ‣ Layer > Select Next Layer to select the next layer up the layer stack, stopping at the top of the stack. ‣ Layer > Select Previous Layer to select the next layer down the layer stack, stopping at the bottom of the stack. Each type of layer is indicated by a different colour and icon to help you clearly identify the type of layer you are working on. The default colours of the layers can be changed in the Global UI tab of the Preferences dialog box—see Preferences.